In 2002, the Florida Legislature created a first-degree misdemeanor for refusing to submit to a lawful test of breath, urine or blood after having previously suffered an administrative suspension for refusing to submit. Fla. Stat. § 316.1939. Now a second refusal is a first-degree misdemeanor punishable by up to $1,000 fine and 12 months in the county jail. The purpose of the law was to discourage a person from avoiding a DUI conviction by repeatedly refusing to take a breath test after each DUI arrest. The most important thing to remember is that you only have ten (10) days to demand a formal review hearing to contest the 18 month hard suspension of your driver’s license. The attorney can help you secure a 42 day permit so that you can keep driving to work. Unless your attorney is successful in getting the suspension invalidated, you will serve the rest of the 18 months without any ability to get a hardship license. One problem with taking this type of case to trial is that the jury KNOWS that the defendant was arrest before for DUI and previously refused to submit to a chemical test. Normally, such “prior bad acts” evidence would be excluded as unduly prejudicial. But evidence about the prior refusal (or at least the driving record showing the prior refusal) is admissible in these cases because it is an element of the offense. If you were charged with a second DUI refusal, then contact an experienced DUI defense attorney at the Sammis Law Firm with offices in downtown Tampa in Hillsborough County and New Port Richey in Pasco County, FL. What should you do if you are charged with a separate crime for a second refusal? The most important thing you should do is hire an attorney within 10 days of the arrest to DEMAND a formal review hearing to contest the administrative suspension of your driver’s license for the second refusal. Your attorney can also help you secure a 42 day permit so that you can keep driving until the hearing. Unless your attorney wins that hearing, you are facing an 18-month hard suspension on an administrative basis if the suspension is upheld. Therefore, it is especially important in these cases to demand a formal review hearing within 10 days of the arrest. Additionally, prosecutors treat these cases very seriously and are reluctant to reduce the underlying DUI refusal case to reckless driving in these cases. You need to aggressively fight these charges in order to get the best result. Contact an attorney for drunk driving defense in Tampa, Hillsborough County, FL. Call (813) 250-0500 to discuss your case during a free and confidential consultation. Keep in mind that the biggest problem with a second administrative suspension for a refusal is that you will suffer an 18-month hard suspension. This means you will NOT qualify for a hardship license during any part of the 18 months. The only way to avoid the 18-month hard suspension on an administrative basis is to CONTEST the 18-month suspension during a formal review hearing. For this reason, it is important to hire a DUI defense attorney to demand the formal review hearing within 10 days of the arrest. Your attorney can also help you obtain a 42 day permit so that you can keep driving to work, church and school while your attorneys prepares for the formal review hearing. Since you will not qualify for any time of hardship reinstatement, it is particularly important to get the 42 day permit which eats into the 18 month hard suspension. For all of these reason, it is important to hire a DUI defense attorney to demand the formal review hearing within 10 days of the arrest. Plus, the information obtained at the formal review hearing might also help you fight the criminal charges later in court. It is also more likely that you might win the administrative suspension because after July 1, 2013, if the arresting officer or breath test operator fails to appear for the hearing then the administrative suspension is automatically invalidated and erased from your driving record. An officer had probable cause to believe to an individual drove a vehicle (or was in actual physical control of a vehicle) while under the influence of an alcoholic beverage or a chemical or controlled substance to the extent that his normal faculties were impaired. The law enforcement officer read the individual Florida’s implied consent warning which says that refusal to submit to the chemical test of breath, blood or urine will cause a suspension of the privilege to drive a motor vehicle for a period of twelve months for a first offense, or in the case of a second or subsequent refusal, for a period of 18 months. The law enforcement officer told the individual that it is a misdemeanor to refuse to submit to a lawful chemical test of his blood, breath or urine if his driving privilege had previously been suspended for a prior refusal to submit to a lawful chemical test of his blood, breath or urine. The individual, after being told about Florida’s implied consent warnings, and the fact that another refusal was a new criminal offense, still decided to refuse to submit to a chemical test when requested to do so by a law enforcement officer. The individual’s privilege to drive had, in fact, been previously suspended for a prior refusal to submit to a chemical test of his breath, blood or urine. The jury is allowed to conclude that the individual’s driving privilege had been previously suspended for a prior refusal to submit to a lawful test of blood, breath or urine if the driving record from the Florida Department of Highway Safety and Motor Vehicles (DHSMV) shows such a suspension. 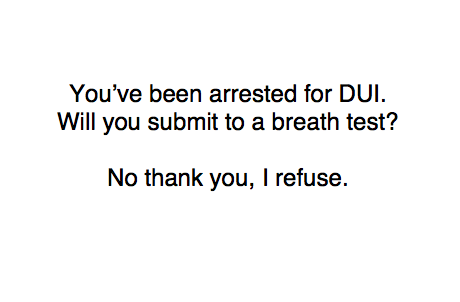 In fact, the statute itself creates a rebuttable presumption of the prior refusal if the department’s records showing that a person’s license has been previously suspended for a prior refusal to submit to a lawful test of his or her breath, urine, or blood. The term “motor vehicle” is defined to mean any self-propelled vehicle not operated upon rails or guide-way, but not including any bicycle, motorized scooter, electric personal assistive mobility device, or moped. Under the statute, the triggering event is the prior suspension by the Florida DHSMV. Therefore, even if the person was not successfully prosecuted for DUI, the person could still be prosecuted for the second refusal. The law only applies to a statutorily-defined subset of DUI arrestees. The prosecutor with the State Attorney’s Office must prove beyond a reasonable doubt that the defendant falls into that subset. As a threshold matter, it must be proven that the defendant’s driving privileges have been previously suspended for a prior refusal. As a practical matter, the only way driving privileges are suspended for a “refusal” is when an administrative suspension occurs for the refusal itself. In fact, the administrative suspension is based on the fact that a refusal to submit to chemical testing actually occurred. The court ordered suspension, on the other hand, is triggered by the DUI conviction regardless of whether a refusal occurred or not (since the refusal itself is never an element of a DUI). Can the prosecutor file a motion for the court to take judicial notice of the Defendant’s driving record as statutorily admissible pursuant to Sections 322.201 and 316.1939(3), Florida Statutes. “….A copy…of …the complete driving record of any individual certified by the department or by the clerk of a court shall be received as evidence in all courts of this state without further authentication, if the same is otherwise admissible in evidence. Further, any court or the office of the clerk of any court of this state which is electronically connected by a terminal device to the computer data center of the department may use as evidence in any case the information obtained by this device from the records of the department without need of such certification; however, if a genuine issue as to the authenticity of such information is raised by a party or by the court, the court may require that a record certified by the department be submitted for admission into evidence. For computer copies generated by a terminal device of a court or clerk of court, entry in a driver’s record that the notice required by s. 322.251 was given constitutes sufficient evidence that such notice was given. Most judges will be quick to require the prosecutor to obtain a “certified” copy of the driving record if the defense raises an objection to the authenticity of the record. Also, most judges will be quick to reject any attempt to admit into evidence a driving record from out of state under these statutory provisions because they clearly apply only to Florida driving records. Sometimes the prosecutor will as for the court to take “judicial notice” under Florida Statute Section 90.202(12) of the driving record under the theory that is qualifies as “facts that are not subject to dispute because they are capable of accurate and ready determination by resort to sources whose accuracy cannot be questioned” also most judges found that taking judicial notice during a jury trial of facts int he driving record is not appropriate. If the driving record is admitted into evidence then any derogatory notations on the record other than the administrative suspension should be redacted before it is published to the jury. Relatively few cases exist dealing with a prosecution for a second or subsequent refusal to submit to testing after a DUI arrest in Florida. In State v. Busciglio, 976 So.2d 15 (Fla. 2d DCA 2008), the Second District Court of Appeals found that a driver that was facing a second refusal did not have a right to counsel under the Florida constitution at the time he was asked to submit to a breath test. The Court reasoned that the question was not an interrogation. Furthermore, the Court held that the answer was not a testimonial response triggering the right against self-incrimination under the Fifth Amendment to the United States Constitution. If you were charged with a violation of § 316.1939, Fla. Stat., for a second refusal to give a breath, urine or blood test, then contact an experienced criminal defense attorney in Tampa, FL, at Sammis Law Firm. Keep in mind that a conviction under this statute requires proof that a person has a prior license suspension because of a prior refusal to take a breath test. Under the statute, finding a first refusal itself is not an element of the offense; rather, it is the driver’s license suspension that is an element of the offense. Fender v. State, 980 So. 2d 516 (Fla. 4th DCA 2007) [32 Fla. L. Weekly D2163b]. it violates the exercise of the constitutional right to be free from unreasonable search and seizures, specifically, the constitutional right to refuse to consent to a warrantless search. 316.1939 Refusal to submit to testing; penalties – Visit the website of the Florida Senate to find the 2015 version of Florida Statute Section 316.1939, which makes it a crime to refusal to submit to a breath test if the driving record contains a prior administrative suspension for a refusal. Find out why the disposition of any administrative proceeding does not affect a criminal action under this section and why the disposition of a criminal action under this section does not affect any administrative proceeding that relates to the suspension of a person’s driving privilege. Within ten days after the arrest, you must take action to protect your driver’s license. If you do nothing, your driver’s license will be suspended for one year after a first refusal or eighteen months after a second or subsequent refusal. Within the first ten days, you can demand a formal review hearing to contest the administrative suspension. While your attorney fights the formal review hearing, we can help you obtain a 42-day permit. If you win then the administrative suspension is completely lifted from your driving record. If you are not able to invalidate the suspension, then your 18 month hard suspension will begin. Contact us to discuss your arrest for refusing a breath, blood, or urine test for a second time under Florida Statute Section 316.1939. Call 813-250-0500. This article was last updated on Tuesday, February 5, 2018.